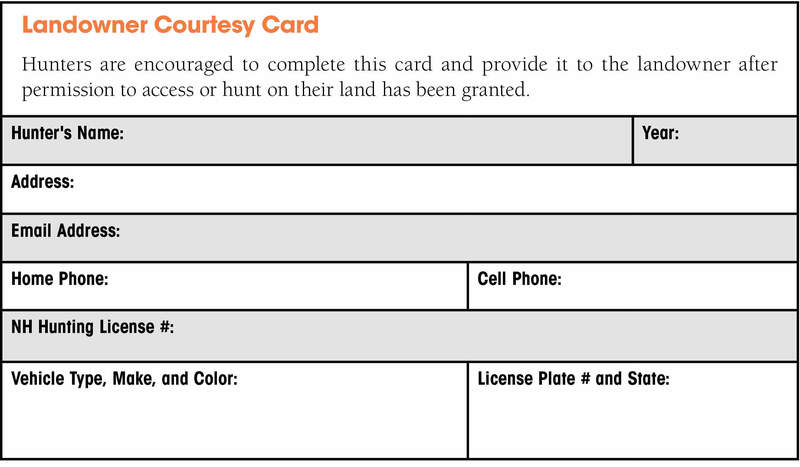 Enjoy your hunt, and follow these basic safety guidelines to get home safe and sound. Most important of all, keep the muzzle of your gun pointed in a safe direction at all times. Be 100% sure not only of your target, but what’s beyond it; even small bullets can travel a mile and half. No hunter, especially when “swinging” on game, should allow his or her gun to point at a person. Better to pass up a shot than risk injuring someone or damaging property. Deer/Bear/Small Game Hunters: Only load your gun when you’re ready to hunt, and unload it immediately after. Also, it’s hard to overstate the importance of wearing a fluorescent orange hat, vest, or jacket. Crossbows: It is unlawful to have crossbow cocked while transporting it in a vehicle. Treat a cocked crossbow like a loaded firearm. Turkey Hunters: Never stalk a turkey—instead, scout out a good spot, call and wait for the turkeys to come to you. Always wear blaze orange as you enter and leave an area. Tie orange survey tape around a nearby tree to alert other hunters to your presence. Lean against a backstop that’s at least as wide as your shoulders. Avoid clothes that are red, white and blue and black, the colors of the male turkey. Pheasant Hunters: It is critically important that bird hunters know their surroundings and the whereabouts of their hunting partners and others before taking a shot. When a bird goes up and you are not sure where everyone is, hold your fire. Control the muzzle of your firearm at all times, and always maintain a safe zone of fire—the area in which you can shoot. Wear safety glasses and hunter orange on your head, back, and chest. Muzzleloaders: Black powder technology is getting better all the time, drawing more participants to this time-honored tradition. Treat every muzzleloader as if it were holding a charge, and mark the ramrod so you can easily check. Be extra careful to attach the ignition source only when you’re ready to hunt—once primed, the gun is ready to fire. Tree Stands: A number of serious incidents have happened to N.H. hunters using tree stands in recent years. 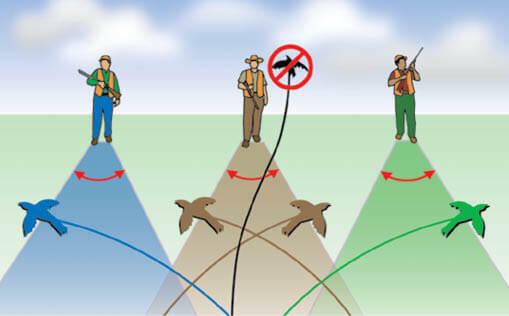 Stay safe by always using a properly fitting full-body harness while climbing trees, installing or hunting from an elevated platform or tree stand. Never carry hunting equipment up or down the tree with you, always use a haul line. When hauling a gun into or out of a tree stand, keep the firearm muzzle pointed away from you. Keep firearms unloaded and the actions open, and broadheads in a hard-cased quiver, when using a haul line. A hunter’s zone of fire changes with every step. Remain alert and aware of your companions’ locations at all times. Used by permission. Copyright © 2010 Kalkomey Enterprises, Inc.
Control the muzzle of your firearm. It should be pointed in a safe direction at all times. Treat every firearm as if it were loaded! Be sure of your target and look beyond, before you ever raise your firearm or draw your bow. Wear hunter orange to make yourself more visible to other hunters. Never assume you are alone in the woods. « New Hampshire Welcomes Hunters!